The Berkshire Immigrant Center, located in Pittsfield, assists people with citizenship assistance, resettlement services, and advocacy. Now, once a month on the fourth Friday, their services will be available at our office at 67 State Road. Appointments can be made by calling the Berkshire Immigrant Center (413) 445-4881 or by contacting Grace Church (413) 644-0022. “At our Wisdom Group Meeting on December 9, 2015, the Reverend Jenny Gregg spoke with us about her work in Pittsfield with people who are immigrants to this country. It was here where we began to talk about furthering our relationship with the immigrants in the Berkshires. At a subsequent meeting John Cheek shared his visit to Ascentria Care Alliance (formerly Lutheran Social Services of New England) in response to the refugee crisis facing Europe. He learned there that Syrian refugees would probably not be resettled in the Berkshires due to a lack of transportation, no settled community group, and few jobs. But that there are many Latino and Hispanic immigrants in our area in need of support. There was a strong consensus from the Wisdom Group that we would pursue ways to build these bridges. Kathy Clausen, Dindy Anderson, and I told the group that we would contact people at the Berkshire Immigrant Center in Pittsfield, who were recommended by the Reverend Jenny Gregg. On January 13, 2016, Dindy Anderson, Kathy Clausen, and I met with Hilary Greene and Elisa Fuller at the Berkshire Immigrant Center in Pittsfield. Hilary told us about the history of the center and its evolution from being a place that served Russian Jewish immigrants, to serving the wide range of immigrants currently living and working in the Berkshires. The Berkshire Immigrant Center assists people with citizenship assistance, resettlement services, and advocacy. After leaving her office with our heads swimming with the work that is needed to be done and the powerful work of this non-profit center, we developed an idea for how Grace Church could partner with this important agency. While we were not prepared to provide trained persons to support immigrants at Grace, we could offer our church office space so that a trained immigration worker could come to South County once a month to meet with clients here. Hilary had mentioned that many of the people they see come from Great Barrington and Lee and have difficulty finding transportation to their office in Pittsfield. At our February 24 Wisdom Group Meeting we talked more about this idea. Kathy Clausen told the group the Hilary Greene from the BIC had gotten back with her and was interested in talking more with us about setting up a place in South County to serve people who live in Great Barrington, Lee, and the surrounding areas. From information gathered through our Parish Mutual Ministry Survey, there was an indication that our community wants to work in the larger community and specifically to serve our Hispanic brothers and sisters. Doreen Hutchinson prepared and submitted a Ministry Development Initiatives Grant on March 1 to the Episcopal Diocese of Western Massachusetts. In this grant proposal we asked for money to support two dialogue sessions/focus groups with people in our area to determine their needs and questions. We also proposed to offer a drop-in center where people could come and meet with the immigrant worker at our church office. We were notified in May that we received the grant from the Diocese of Western Massachusetts. On April 12, Kathy Clausen and I again traveled to the Berkshire Immigrant Center to visit with Hilary Greene. In our meeting Hilary talked about her interest in sending a trained member of her staff to South County once a month to meet with people regarding resettlement and immigration issues. She agreed that it was a good idea to offer listening groups so that people could come together from the immigrant community and ask their questions and express their needs. She will not be able to come herself, but will send Elisa Fuller who is a trained immigrant advisor and speaks English and Spanish. She also asked that we contribute $2500 dollars for the year to support this work. 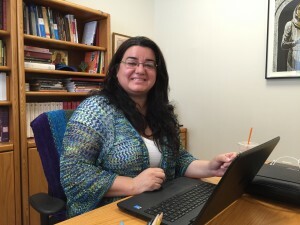 Following a meeting among Elisa Fuller, Maria Mayorga, our office assistant, and me on April 15, and with the approval of the Vestry, we have agreed to offer our office space once a month on the fourth Friday, beginning May 27, 2016. Elisa will use my office for confidential interviews and counseling. Maria will be able to greet those who make appointments and get them started on filling out paperwork for their visit. Elisa would also like to be able to use our copier.